Take home message: A new study confirms that taking 2000 µg of vitamin B12 per week orally (cyanocobalamin) should be a reliable source of B12 for most people. result 1: Yes, oral B12 seems to work just as well. result 3: 2000 µg of oral vitamin B12 (cyanocobalamin) per week is a safe dose. No adverse events were observed. my own conclusion: For vegans who do not have problems with vitamin B12 absorption (the absorption mechanism works) 2000 µg per week of vitamin B12 (cyanocobalamin) seems to be a safe and reliable source of B12. 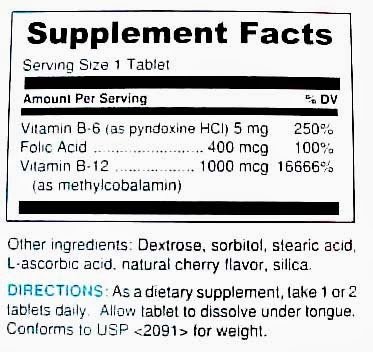 They also list some vitamin B12 supplements available in Spain which contain 1 mg (1000 µg) or 2.5 mg (2500 µg) . I don't know how much these supplements cost and there might be cheaper ones. "In our public National Health System, B12 ampules are covered under all provincial health drug plans, while B12 tablets are not covered. Thus, oral B12 tablets probably save public Health Service resources, but are more expensive for Spanish patients." "[...] our patients had good tolerability without adverse events after high oral dose of vitamin B12."